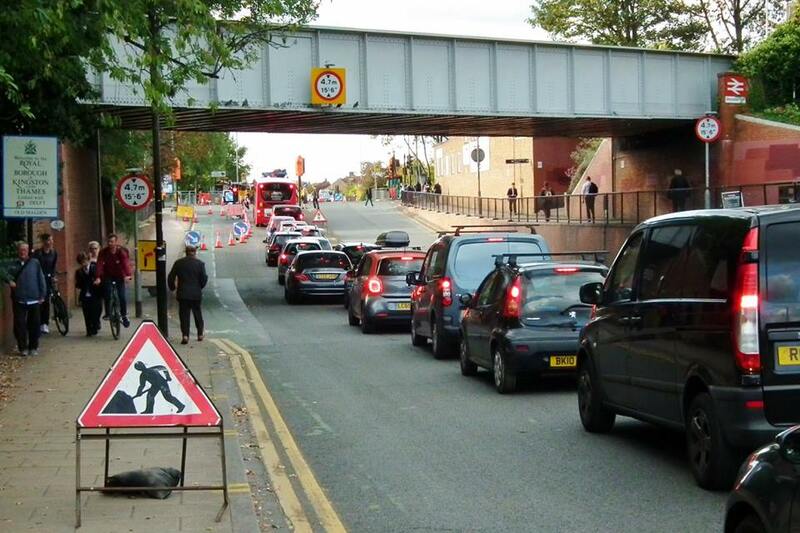 The works on Malden Road, at the junction with The Manor Drive, started earlier this week. But car and bus drivers have reported delays of 3 hours at times to get from the North Cheam traffic lights to Worcester Park station, a journey of less than 5 minutes in no traffic. Commuters have also raised safety issues at the station, saying the delays are leading to people "barging" the train doors when they eventually arrive on the platform. Sutton Council says the works are vital because any excess water from rain, or a broken drain as is the case here, leads to flooding under the railway bridge. We've received this statement from Sutton Council. "These works are to renew a broken drain. This was a high priority repair, as this area has been the subject of a number of flooding issues. The works taking place should alleviate this problem. Given the location, for the work to be carried out safely, the only option was to use four way temporary traffic signals to maintain traffic flow. These works were planned in conjunction with both boroughs, and the TfL Bus Operations Team. Whilst "night works" only would have eased the impact of this repair, it was neither possible or practical because of the excavation. Advance warning signs were in place in the week before the works started. Originally, the works are expected to finish on Wednesday evening, however due to underground problems being encountered, this had to be extended by a day. The road will be fully open again before Friday's morning rush hour, including TfL re-cutting the induction loops for the permanent Traffic Signals." In June 2016, rainfall led to flash flooding under the bridge.